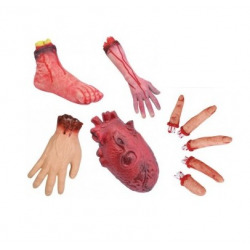 We have grouped several halloween props and decorations together to enable you to make 'BIG SAVINGS' on multi buys. The benefit of buying from this section will save you .....££££££££'s......and make your 'Happy Halloween' even 'Happier'. These Devilish Red Goblets would cost £3.75 each if purchased individually. Save £3.00. Raise your glasses and drink to a 'Happy Halloween' with our Devilish Red Goblets. Featuring a gold claw and skull design on the stem, they are perfect for serving up 'spirits' and look great on the halloween banquet table. Supplied in a set of 4 plastic Goblets. 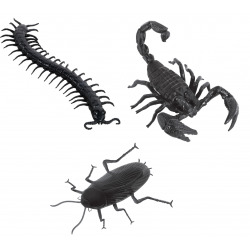 SPECIAL MULTI-BUY PRICE SAVE A FURTHER £8.00 COMPARED TO INDIVIDUAL PRICES Our Skeleton Dog would normally cost £14.95 and the Skeleton Cat £12.95. 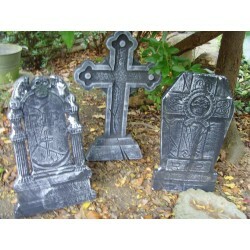 SPECIAL MULTI-BUY PRICE SAVE £10.00 COMPARED TO INDIVIDUAL PRICES Purchased individually these three various Tombstones would normally cost £39.85.